Affordable tariffs, neat and clean camping huts/tents, homely atmosphere and cool and calm surroundings make this place the best place to stay in Manali. Adventure camp in Manali, Camping on high mountains, Trek to Bhrigu Lake, Trek to Jogini Falls, River crossing, Rappelling. Mountains are a perennial source of joy to those who have eyes that can appreciate beauties of nature. Nowhere does nature reveal her charm in greater abundance than at green and flowering mountain tops with transparent streams of water flowing down their slopes or on snow clad hills where sunlight weaves its magic colour into their virginal whiteness. To lover of mountains, the sound of waterfalls is like the joyful clapping of merry primitive dancers and the howling of night winds contains a musical pleasantness, which surpasses the highly sustained rhapsodies of man made organs. Lakes in high altitude, holding within their cup-like mountainous enclosures the watery wealth of the surrounding glaciers, treeless plateaus covered with rare varieties of grass, plants and flowers and yawing chasm into whose dark, unfathomable interior nature’s countless species of animals and plants carry on their fight for existence, are attraction so powerful and irresistible that no one can turn a deaf ear to their call. These widely-scattered, ever-alluring treasures of nature are the trekker’s and camper’s greatest inducement to wander with a hungry heart in search of beauty, peace and adventure along the beautiful slopes of sky-embracing heights. Himalayan Mountain Sojourns is Trekking and Adventure Camp organizer at Manali in Himachal Pradesh. We organize adventure camps for students of schools, colleges and individual/family groups. 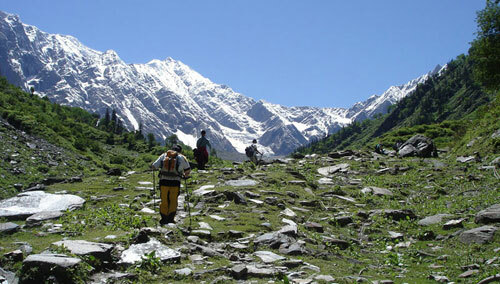 Also, we organize trekking on all the popular routes around Manali. Himalayan Mountain Sojourns has two campsites. Apple Orchard Camp has been developed in an apple orchard. It gratifies the aspiration of those who wish to camp in the rural Himalayas. Here you get opportunity to live in Tents and can do adventure activities of Rock Climbing, Rappelling, River Crossing and Day Treks. The natural Rock Field at river side is at short distance from Campsite. Contrary, if you are the sort who doesn’t care to work up healthy sweat on the mountain slopes and instead wish to spend your leisure leisurely lounging in cozy beds or simply gazing out of your tent window……… then Himalayan Mountain Sojourns has its small camping huts to welcome you. Simple, peaceful and clean these huts have French windows gaze at mountains. 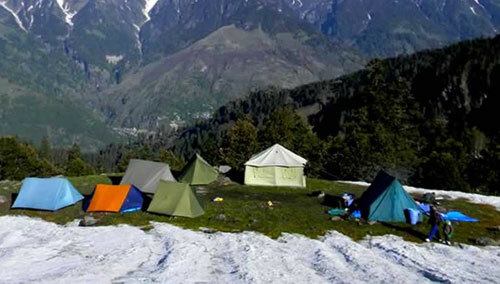 Adventure camping in Manali is trending high among the youngsters who throng to this place during holidays. This is in real sense an adventure camp in Manali. This is a lonely place high on the mountain amongst thick pine and oak forest. It takes three hours to reach there from Manali town. The regular program of this camp includes the trek to Bhrigu Lake that takes you to an altitude of 14000 ft – half of the altitude of Mt. Everest. We do not have any artificially erected structures inside the camping site to do adventure activities. Instead we take the participants out to the natural rocks and river side for real adventure in real environs. 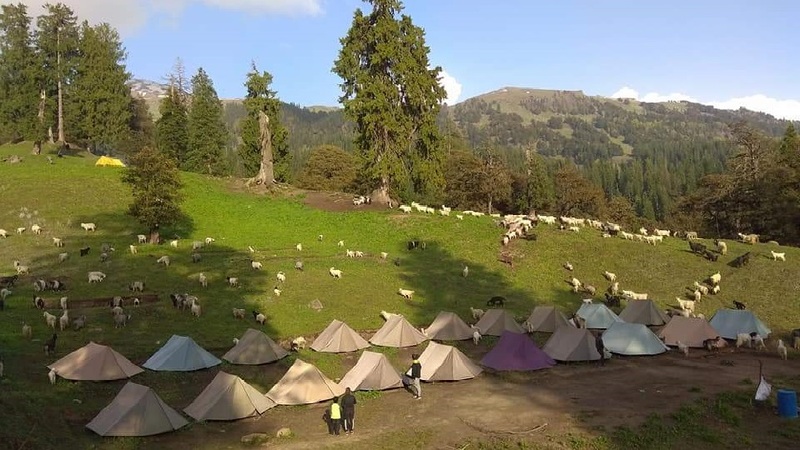 Also the Campsite is a natural ground to know the Himalayan flora and fauna. During the early summer the snow field starts from the backyard of the campsite and in the late summer it recedes back to give us a walk of one hour or so from the campsite. Apart from camping in Manali, we organize trekking in Manali. Trekking creates the spirit of adventure in human, provides opportunity to come in contact with nature, see the countryside and its people, channelize their energy in right direction, enrich their experience and build their character by making them live with fellow trekkers away from the comforts of home life. In the mountains one can test one’s limits, weaknesses, strength and courage and thus conquer oneself and nobody else. Manali can boast of some of the most popular treks in India like Bhrigu Lake Trek, Hampta Pass Trek and Beas Kund Trek. Being a Manali based Adventure Company, Himalayan Mountain Sojourns has prepared itinerary for these routes that are highly professional and flawless. Besides Bhrigu Lake Trek, Hampta Pass Trek and Beas Kund Trek Himalayan Mountain Sojourns has six more treks in its archive namely Hampta Meadows Trek, Hampta Pass Trek with Chandertal Lake, Chanderkhani Malana Trek, Seri Chandertal Trek, Bara Bhangal Trek, and Snow Trek in Manali.